iPhone and iPad owners already own the most powerful filmmaking equipment on the planet. Consider this the on switch. In Hand Held Hollywood’s Filmmaking with the iPad & iPhone, director Taz Goldstein exposes how Apple’s remarkable mobile devices can aid in nearly every aspect of film and video production.nnWritten to empower aspiring filmmakers and reenergize working professionals, this book will help transform your iOS devices into revolutionary filmmaking tools, perfect for brainstorming, screenwriting, pitching, scheduling, storyboarding, camera blocking, shooting, editing, color correcting, mixing, distributing, and more. Time-tested techniques and film theory are woven into an entertaining and informative exploration of nearly 200 mind-blowing apps and accessories. Want to download a free chapter? Just sign up for our newsletter! Add a wide-angle lens to your iPad’s camera. Connect a professional microphone to your iPhone. Turn your iDevice into a teleprompter. 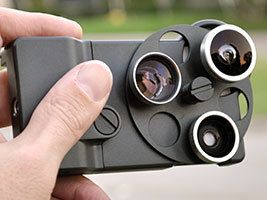 Explore dozens of incredible accessories (even an iPhone Steadicam!) 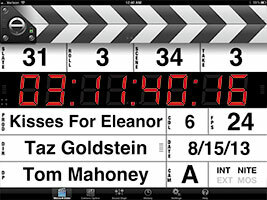 designed to expand the functionality of your iOS devices and make you a better filmmaker. Filmmaking with the iPad & iPhone will help you navigate the entire filmmaking process while providing time-tested tricks of the trade. This unique and often humorous guide is truly the first of its kind, and will help you squeeze the most out of the awesome technology you already own. "It's not just about creating content with the iPhone and iPad, although there are a bunch of gadgets discussed in the book to do exactly that. The author also covers software that is very useful for imagining, planning, and executing your vision. . .It's a valuable reference that I will find myself going back to over and over again." "There's stuff you're going to want to jump into right away. Flipping through the book, you'll find solutions to many of the tasks you've been doing analogue style. Hand Held Hollywood's book will break through the clutter and spotlight the best apps for you to try out." 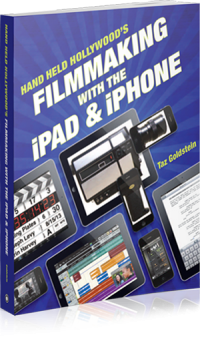 "This is a manual on how to use the iPad/iPhone through every stage of the process of making a film, from conceiving a screenplay, to pitching the project, prepping the shoot, filming, postproduction, all the way to posting your finished masterpiece to the web --- And it’s an enjoyable read too; Goldstein keeps it funny and lively and actually entertaining, a rare feat in a book about technology." "In Filmmaking with the iPad and iPhone you'll learn about storyboards and blocking diagrams; about mind maps, shot lists, and shooting schedules; about screenplays versus ad-lib scripting. Use his clever QR code links for maximum efficiency in learning about new hardware and software." "I've created a lot of iPhone video. This book captures everything you need to know to get started including hardware, software, and services. I promise you'll walk away with new ideas and things you'll want to try. I highly recommend this book." "Taz Goldstein really does his homework here. I am an app developer and never knew of all these apps. If you're an indie filmmaker, this is the first tool you should have in your arsenal." "Taz has produced what I can only describe as 'The definitive mobile production field guide' My copy arrived on Christmas eve and I haven’t been able to put it down since. The list of Apps and Hardware accessories is incredibly comprehensive- If you buy one book on iOS film production this should be it." The perfect gift for every mobile media maker!